Louis Moinet takes us 20,000 leagues under the sea with the Jules Verne Instrument III, a timepiece that sends us off on a voyage with Captain Nemo. 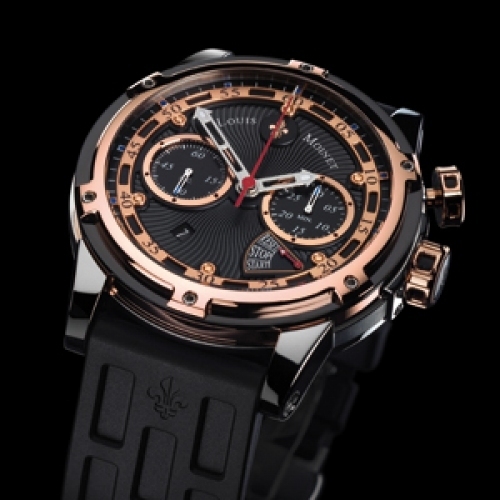 Inventive, technological and original all describe this chronograph. Inventive for the subaquatic-style monopusher and an astonishing function indicator (patent pending) inspired by chadburn ships' telegraphs. 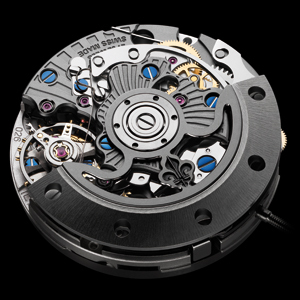 Technological because of its high-precision mechanism featuring ceramic ball bearings that ensure more efficient winding. 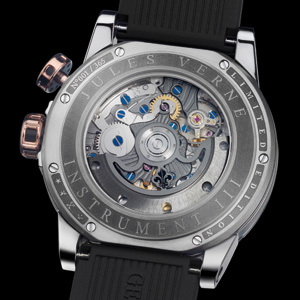 Original with its black dial finished with "Côtes du Jura" guilloché, and a gold and titanium case with more than a hint at Nemo's Nautilus submarine. The monopusher at 2 o'clock also rates high in the originality stakes. A journey into time that fans of Louis Moinet will not want to miss! Proposed as a 365-piece limited series.